For other people named Daniel Davis, see Daniel Davis (disambiguation). Daniel Davis (born November 26, 1945) is an American stage, screen, and television actor. 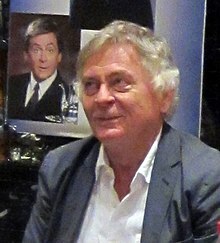 Davis is best known for portraying Niles the butler on the sitcom, The Nanny (1993 to 1999), and for his two guest appearances as Professor Moriarty on Star Trek: The Next Generation, affecting an upper class English accent for both roles. He voices the intelligent Cro-Magnon, Longhair, from the Longhair and Doubledome cartoon shorts from Cartoon Network's Big Pick. In 2016, Davis played Selsdon Mowbray in the Roundabout Theatre revival of Noises Off at the American Airlines Theatre in New York City. The production opened on January 14 for a limited engagement, running through March 6, 2016. Davis was born in Gurdon, Arkansas, and grew up in Little Rock. His parents operated a cinema. His first acting job was at the age of 11, when he was cast in a local broadcast program, Betty's Little Rascals. Davis graduated from Hall High School in Little Rock in 1963. He graduated from the Arkansas Arts Center with a Bachelor of Fine Arts, followed by work with the Oregon Shakespeare Festival, the Stratford Shakespeare Festival, and six years with the American Conservatory Theatre (ACT). During his time at ACT, he taught acting classes. Davis first became popular in daytime television playing opposite Beverlee McKinsey as her character Iris Cory's former (and presumed dead) husband, Elliot Carrington, on the soap opera Texas, a spin-off of Another World, from October 1980 through December 1981. In 1985, he played a renegade soldier in the Season 4 episode of the television series The A-Team "The Doctor is Out". Davis played his most famous character, Niles the Butler on the television series The Nanny, throughout its run from 1993 to 1999 and in its reunion special in 2004 (in cameo flashbacks only). Niles was known for his frequent use of deadpan one-liners, usually insulting character C.C. Babcock, whom Niles eventually fell in love with and married in the series' last season. Davis' natural accent is Southern American; however, his English accent as Niles was so accurate that many viewers have been convinced that Davis actually is English. He also used an English accent as Professor Moriarty in the Star Trek: The Next Generation episodes "Elementary, Dear Data" and "Ship in a Bottle." However, as the Commanding Officer of the aircraft carrier USS Enterprise in the 1990 film The Hunt for Red October, Davis spoke with his own American accent. Davis' voice role for Longhair used a British accent. In 2002, Davis guest-starred on the television series Frasier, playing Dr. Shafer in Season 10, Episode 8, "Rooms with a View". Davis was among the group of celebrities lip-synching to The Bee Gees' Stayin' Alive on the Idol Gives Back episode of American Idol on April 25, 2007. He appeared briefly in the 2006 film The Prestige, directed by Christopher Nolan. In July 2008, Davis portrayed King Lear at the Shakespeare Theatre of New Jersey, under the direction of Bonnie J. Monte. That year he also guest-starred on the television series Ugly Betty. In November 2010, Davis was part of the Celebrity Autobiography series at the Long Center in Austin, Texas. He performed along with fellow Nanny alum Lauren Lane and Ugly Betty alum Michael Urie. In December 2010, he guested on The Fran Drescher Show through Skype. In 2012, he recorded the audiobook of the Star Wars novel Star Wars: Darth Plagueis, by James Luceno. Davis is an established theatre actor. He has appeared in both Broadway and off-Broadway productions in New York, and has appeared at the Guthrie Theater in Minneapolis, Minnesota. Off-Broadway, he played Rubin in Lake No Bottom in 1990, the Duke of Buckingham in The Tragedy of Richard III, Graham in the Alan Bennett monologue "A Chip in the Sugar" for the series Talking Heads in 2003, and he starred as Gaev in The Cherry Orchard in 2011. On Broadway, he played Antonio Salieri in Amadeus in 1980, Maurice Montesor in Wrong Mountain in 2000, Oscar Wilde in The Invention of Love in 2001, Georges in La Cage aux Folles in 2004, George Bernard Shaw in The Frogs, also in 2004. In 2007, Davis was a member of the cast of an audio production of the play Blue/Orange, in which he took the part of Dr. Robert Smith. In 2012, he played Prospero in The Tempest at Hartford Stage. In 2016, he appeared on Broadway as Selsdon Mowbray in the Roundabout Theatre revival of Noises Off at the American Airlines Theatre. 1983 Hardcastle and McCormick Joe Kello Episode: "The Day the Music Died"
1984 Highway to Heaven Lance Gaylord Episode: "Catch a Falling Star"
1985 Remington Steele Pierre Fumar Episode: "Gourmet Steele"
1985 Scarecrow and Mrs. King Robert Castille and Tony Martinet Episodes: "Vigilante Mothers" and "All the World's a Stage"
1986 Matlock James Billings Episode: "The Professor"
1986 Cheers Mr. Reinhardt Episode: "The Peterson Principle"
1987 Dynasty Harry Thresher Season 8 - 5 Episodes: "The New Moguls", "The Spoiler", "Images", "The Rifle", & "The Scandal"
1988-93 Star Trek: The Next Generation Professor James Moriarty Episodes: "Elementary, Dear Data" and "Ship in a Bottle"
1989 MacGyver Mr. Helman Episode: "Halloween Knights"
1992 Columbo Wedding photographer Episode: "No Time to Die"
1992 Civil Wars Harvey Gutfruend Episode: "Tape Fear"
1992 L.A. Law C. Howard Grady Episode: "Love in Bloom"
1992 Murder, She Wrote Neal Dishman Episode: "Badge of Honor"
2000 The Practice Judge Barton Wolfe Episodes: "Summary Judgment", "Germ Warfare" and "Appeal and Denial"
2002 Frasier Dr Shafer Episode: "Rooms With A View (Part 2)"
2015 Gotham Jacob Skolimski Episode: "Under the Knife"
2017 The Blacklist Baldur Magnusson Episode "Natalie Luca [#184]"
^ "IMDb Biography of Mr. Daniel Davis". Retrieved June 24, 2016. ^ "Noises Off 2016". Broadway World. January 14, 2016. Retrieved October 4, 2016. ^ "Daniel Davis". Playbill Vault. Playbill. Retrieved December 22, 2014. ^ a b Arkatov, Janice (February 18, 1987). "Daniel Davis: An Actor In His Milieu". Los Angeles Times. Retrieved December 22, 2014. ^ Zoren, Neal (September 21, 2014). "Michael Learned and Daniel Davis write new chapter in 'Love Letters'". Delaware County Daily Times. Retrieved October 25, 2014. ^ Ludvigson, Evelyn (December 21, 1994). "Lucky Jill Eikenberry only takes projects that interest her". The Spokesman-Review. Retrieved December 22, 2014. ^ Horwitz, Simi (September 7, 2004). "Daniel Davis: Playing Shaw in "The Frogs"". Backstage. Retrieved December 22, 2014. ^ "The Nutler presents...Daniel Davis in the American Theater Wing Seminar". Angelfire.com. April 19, 2001. Retrieved February 12, 2012. ^ "Wrong Mountain". Playbill Vault. Playbill. Archived from the original on October 26, 2014. Retrieved October 25, 2014. ^ Gans, Andrew; Simonson, Robert (March 28, 2005). "Daniel Davis Let Go From La Cage; Robert Goulet to Step in Mid-April". Playbill. Retrieved October 25, 2014. ^ "Long Center Presents Celebrity Autobiography". Thelongcenter.org. Archived from the original on March 16, 2012. Retrieved February 12, 2012. ^ a b c d "Daniel Davis Theatre Credits". broadwayworld.com. Retrieved March 8, 2018. ^ Rizzo, Frank (February 9, 2012). "Daniel Davis Is Prospero In "The Tempest" At Hartford Stage". Hartford Courant. Retrieved December 22, 2014. This page was last edited on 8 February 2019, at 08:16 (UTC).